Tellows Blog - Die Inverssuche von der Community für die Community! This entry was posted in Offline Abzocke, Telefonabzocke and tagged betrug, Diebstahl, Fake, Gefahr, Masche, Polizei on Friday April 12th, 2019 by tellows.de Team. 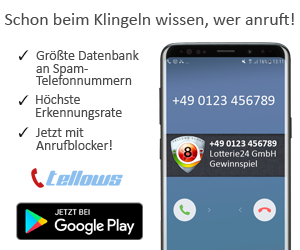 This entry was posted in Offline Abzocke, Online Abzocke, Telefonabzocke, Telefonspam and tagged datenklau, Datenmissbrauch, Enkeltrick, Hacking, Masche, persönliche daten, Ping Anruf on Friday March 15th, 2019 by tellows.de Team. This entry was posted in Allgemein, Online Abzocke, Telefonabzocke, Telefonspam, Über tellows and tagged 2019, Abzocke, Betrugsmasche, Brasilien, Deutschland, Frankreich, international, Italien, Ländervergleich, Nutzerverhalten, Spam, Statistik, Studie, Telefonterror, Unerwünschte Anrufe on Friday March 1st, 2019 by tellows.de Team. This entry was posted in Offline Abzocke, Rechtliches, Telefonabzocke, Telefonspam and tagged Bundesnetzagentur, Ping Anrufe, Ping-Calls, Preisansage, Rückruf, Telefonbetrug on Thursday February 21st, 2019 by tellows.de Team. This entry was posted in Offline Abzocke, Rechtliches, Telefonabzocke, Telefonspam and tagged Auslandsnummer, betrug, Bundesnetzagentur, Hacking, Router, Telefonabzocke, telefonanlagen on Thursday February 7th, 2019 by Niklas Sommer. (Deutsch) Das neue iPhone Update ist da! This entry was posted in Apps and tagged Anrufblockierung, Anruferkennung, Anruferschutz, Apps, Caller ID, iOS, IPhone App, Mobile Rückwärtssuche, Mobiler Schutz, Spamschutz, tellows iPhone on Monday January 21st, 2019 by tellows.de Team. This entry was posted in Allgemein, Über tellows and tagged Bewertungen, Bundesnetzagentur, jahresrückblick, Magazin, tellows App on Wednesday January 16th, 2019 by tellows.de Team. (Deutsch) Endlich ist es da: Unser neues Magazin! This entry was posted in Allgemein, Über tellows and tagged eBook, hilfe, kostenfrei, Magazin, Neue Auflage, Telefonbetrug, Telefonspam, Telefonterror, Tellows on Thursday December 20th, 2018 by Niklas Sommer. This entry was posted in Allgemein, Über tellows and tagged 2018, Auswertung, Bewertungen, Brasilien, Deutschland, Italien, Kolumbien, Ländervergleich, Länderverteilung, Mobile Nutzung, Nutzerverhalten, Spamanrufe, Statistik, tellows Nutzer, Unerwünschte Anrufe on Tuesday November 20th, 2018 by Michelle Fuchs. This entry was posted in Telefonabzocke and tagged Bundesnetzagentur, Phishing, Smishing, SMS, Telefonbetrug, Vishing on Friday October 26th, 2018 by Lisa Günther.